This Appendix provides a summary of metropolitan councils' LTP financial forecasts. 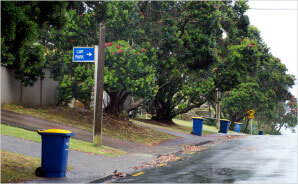 Metropolitan councils have populations exceeding 90,000 and do not include Auckland Council (which is included in Appendix 3). The data presented below is based on our own analysis and represents averages of data across councils in this sub-sector, unless otherwise stated. In this Appendix, we have combined and presented financial information prepared by the metropolitan councils. We do not have a view on the merits of these councils' financial forecasts, other than what we express in the main body of this report. In metropolitan councils' 2018-28 LTPs, the forecast operating revenue is 22% more than what was forecast for 2015-25. Hamilton City Council and Tauranga City Council revenue is forecast to increase by more than 50% from what was forecast for 2015-25. Metropolitan councils' rates revenue is forecast to increase by 60% ($1.6 billion to $2.6 billion) across the 2018-28 LTPs. Metropolitan councils' forecast rates revenue as a proportion of total revenue ranges from 57% for Tauranga City Council to 76% for Upper Hutt City Council. Operating expenditure forecast in the metropolitan councils' 2018-28 LTPs is 23% more than what was forecast for 2015-25. Tauranga City Council's expenditure is forecast to increase by more than 50% from what was forecast in the 2015-25 LTPs. By 2024/25, metropolitan councils' operating expenditure as forecast in the 2018-28 LTPs is expected to be 14% more than what was forecast in the 2015-25 LTPs. Capital expenditure for metropolitan councils is forecast to increase by 35% for 2018-28 compared with the forecast for 2015-25. 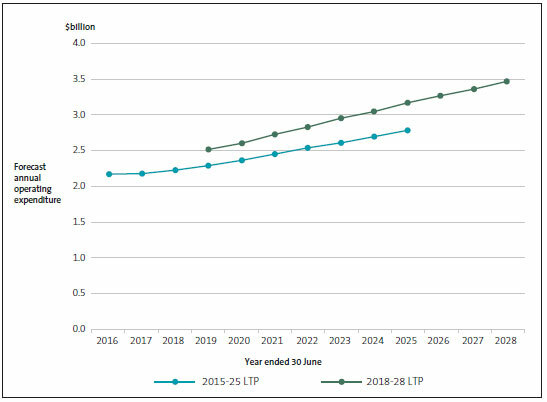 Metropolitan councils are forecasting to spend relatively more to meet additional demand and to improve levels of service compared with the 2015-25 LTPs. Metropolitan councils' capital expenditure is forecast to be largest (at more than $1.4 billion each year) from 2018/19 to 2021/22. In the metropolitan councils' 2018-28 LTPs, debt is forecast to increase from $4.1 billion to $7.0 billion from 2018/19 to 2027/28. This is an increase of 72%. Metropolitan councils' debt is forecast to be 27% of the total sector debt by 2027/28. 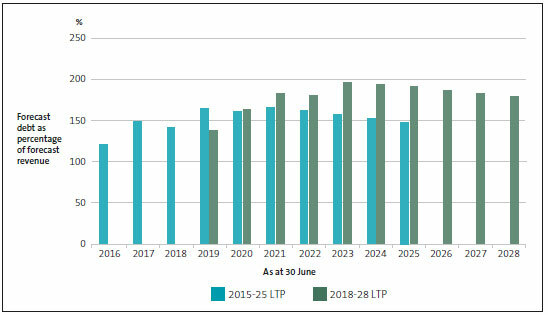 The increase in forecast debt compared with the 2015-25 LTPs is mainly from funding some of the high-growth councils' capital expenditure forecasts. 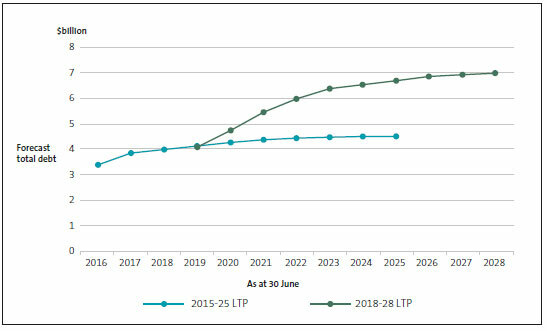 Except for 2018/19, metropolitan councils' forecast debt burden is forecast to be more for each year than what was forecast in the 2015-25 LTPs and, as a percentage of revenue, is forecast to peak in 2022/23.